1. Prepare and bake brownie mix according to package directions; cool. Cut into 2-inch squares. 2. Cook 2/3 cup whipping cream and 1 2/3 cups morsels in a small saucepan over low heat, stirring constantly, until blended; remove from heat, and stir in vanilla. Chill 30 minutes. 3. Beat remaining 1 1/3 cups whipping cream at high speed with an electric mixer until soft peaks form. Stir one-third of whipped cream into chocolate mixture. Fold in remaining whipped cream. 4. 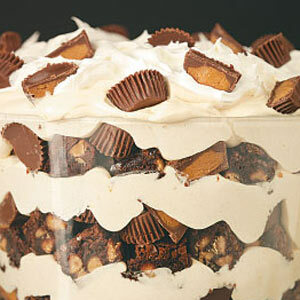 Layer half of brownies in bottom of a 3 1/2-quart trifle dish or bowl; top with half of chocolate mixture, half of chopped peanut butter treasures, and half of whipped topping. Repeat procedure with remaining brownies, chocolate mixture, chopped peanut butter cups, and whipped topping. 5. Sprinkle 1 2/3 cups morsels in an even layer on a parchment or wax paper-lined baking pan. Bake at 200° for 2 minutes or until morsels are evenly melted; chill 1 hour or until firm. Break into large pieces. Garnish top of trifle with peanut butter-chocolate pieces.